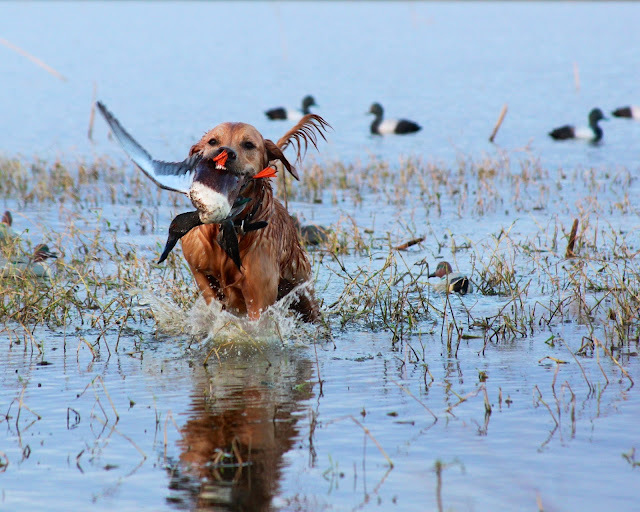 I had the pleasure of being invited on a last minute duck hunt this past weekend with my buddy Robert. Unlike me, Robert knows a great deal about waterfowl, ducks, geese, decoys, decoy spreads, hunting dogs, calls, quacks and whistles. The hunt was overall great with 4 hunters taking 18 birds. There are already meals planned as a result. But two things really, truly stood out in my mind. Watching ducks respond to calls, circle the spread a few times while you hold you breath, afraid to move and then finally commit to landing with cupped wings as they glide through the crisp, cool air was truly mesmerizing. Several times I caught myself stating out loud how beautiful the entire chain of events was. The other thing which was beautiful to watch was Robert's dog Milo. Robert has obviously worked a great deal with Milo and it was truly impressive to see the two interact with each other. Milo's enthusiasm for his role and response to whistles and hand signals helped me forget I did not wear enough clothing for the weather. It was simply a wonderful day to be alive and with like minded folks. Milo the Swamp Hound in action! I used to tell myself (and still tell my kids)... "There is no reason to be afraid of the dark. There is nothing in the dark that isn't there in the light". Of course, there ARE things that ARE there in the light which SHOULD genuinely scare you. The dark only hides them better. This past Saturday I had the great fortune to be in the woods before sun up, deer hunting. The air was cool, the woods were quiet. It really does not get much better than this. As usual, I parked the 4-wheeler about 300 yards away from my stand and slowly, quietly walked in. Usually, I'll place some scent or other attractants around the stand depending on the conditions, wind direction, etc. This particular stand sits at a 3-way intersection. After placing my gear in the stand, I walked north to place some scent in that direction and started to head east past the stand for a final scent marking. The sun was just coming up and it was just light enough to see without a flashlight so I was "running dark", barely able to make out the path. About 20 yards past the stand, another 30 yards ahead of me, I noticed something that just did not seem quite right. I thought to myself... "I don't remember there being a big stump right there". And then the stump moved. Quicker than a politician back-peddling on a lie, I did an abrupt aboutface and hauled my carcass into the safety of the stand. A few minutes later, with enough light to see, the stump had morphed into several stumps. There was a group of feral hogs milling around, eating acorns generally being pigs. I reviewed the menu options, looking for a perfect sized meat-hog for the cooler when something else moved into view. There, at the back of the sounder was a much bigger pig. 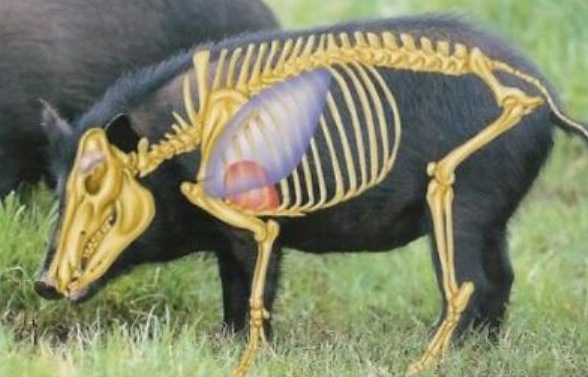 It was a boar. A really big boar. I mentally switched from meat haul to eradication mode. The hogs moved a bit closer and finally, at about 30 yards, I had a clear shot of the boar. Unfortunately, I forgot that a hog's cervical spine (i.e. neck) dips down when I aimed. The bullet hit him high, paralyzing but not killing him. I should have shot again immediately but I was, after all, deer hunting and did not want to make any additional noise. He was down and bleeding. I waited, assuming he would bleed out soon and it would all be over. Some time later though, he would still occasionally move a leg or his head. Brandishing the largest knife I owned, I slowly climbed down from the stand (with my rifle over my shoulder) and slowly crept up on the boar who was facing away from me. I'd seen this done dozens of times before on the Discovery Channel... I'd just slip up, insert the knife between his ribs and finish him off. He was, after all, very near dead. 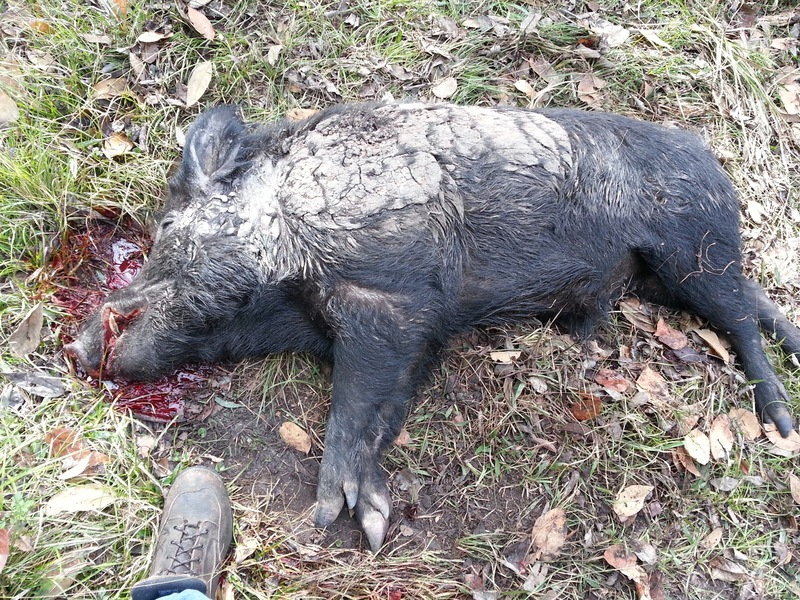 Apparently, this boar was NOT a fan of the Discovery Channel and had not read the same script. Instead of laying there nearly dead, when he heard my footsteps about about 8 feet, he whipped his head around, looked me in the eyes and LOUDLY started snapping his jaws and flashing his tusks, trying to scare me. And I'm not too proud to admit... it worked. The last 3 sounds the boar heard were (i) urine running down my leg, (ii) my thumb nail breaking as I switched off the safety and (iii) the muzzle blast of a .270 at point blank range. I'm pretty sure he did not hear the shaking that started afterwards. I've not decided yet if I need to find a closer parking spot for future hunts.